Open Site: ETI "FM Radio Gravitational Waves Observatory"
(ETI) Intelligence advanced Extraterresttial civilization. Link.. "FM Radio Waves" Astromony. that was sent to us by the watchers"
03/06/2006 Via The ETI Radio Telescope. Orbiting around the Earth is a mysterious, dark object which dates back perhaps many years. Its origin and purpose are a mystery, dubbed the “Black Knight” this invisible most of the time satellite has been sending signals towards the Earth and inspected by the Goverments yet only a few on Earth know of its existence. The origin of the name is part of the mystery. Humans have only in the last 54 years had the technology to send a man-made object into space so what is the explanation of an alien intruder on our doorstep. 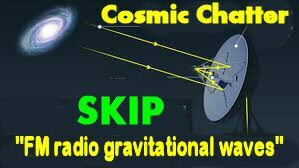 The Universe is big place, PhD's are trying now searching for alien probes near Earth, call the Black Knight satellite...Its been spotted near the moon and earth orbit and remains invisible most of the time. 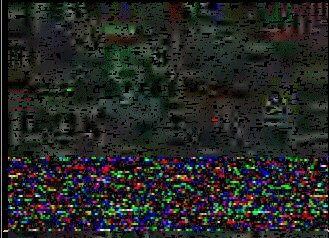 someone on Alpha Centauri might be Broadcasting. I've had the Azden since sometime in the early 1990's, operating it as a fixed station rig. 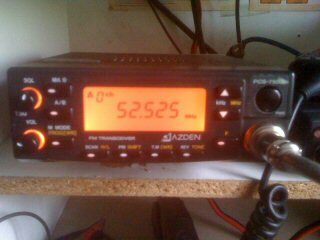 The Azden PCS-7500H is a 6m FM transceiver the greatest 6 meter FM radio ever maded with a whopping price of $530.00 usd in the 1990's, it has 20 memories (10 in each memory 'bank'). It has a very odd method of programming CTCSS tones, requiring the use of a code cross reference list from the owner's manual each time, and one must set the rx & tx tones separately (PCS-5000 2M works the same way) Regular MFJ microphone will work fine if not better than the push button microphone and you can do all the programing with the front panel buttons on the Azden, you don't need the push button microphone to program the radio. It produces 10 watts on low transmit 50 watts on high With a built in fan thats very quite and only comes on when the unit heats up, with a outstanding receiver. Satellite dish make excellent directional antenna. 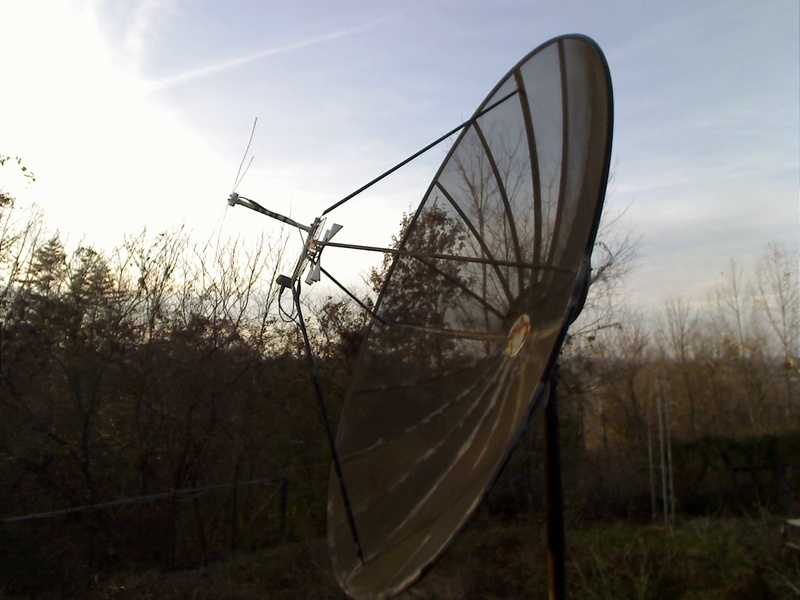 Remove the existing LNB from the dish and replace it with a homemade antenna, like a UHF biquad For deepspace ETI Listening and tuned for your band-of-interest Or (i.e. selectable Dual Band 2.4 Ghz or 5 GHZ for wi-fi). A powerful (high RX sensitivity & high TX power) wireless Linksys AE1000/High Performance wireless -N USB Adapter is what i use. This is a description of my ETI radio telescope project for observing ETI radio emissions Found throughout our galaxy. This project is a hobby that combines mechanical, electrical, electronic, radio frequency, astronomy, physics, math, and software challenges. Some proficiency is required in all of the areas in order to obtain meaningful results. It has been fun and VERY educational! I find it interesting to observe strange radio signals from 50 years ago to the present day. It is gratifying to compare my results with what I find in the news today and share the excitement of the goverment researchers. Who knows? Maybe I will stumble across something they missed! I never get bored and am always looking for ways to improve the quality of the data,receiver sensitivity, antenna design, and better software. I do not have the external funding. No grants or advances. Everything is bought out of my pocket on a fixed income! This means no deadlines, no publication dates, no pressure. I can take my time, focus on the areas that interest me the most, and enjoy! KY6MTR:Split sight repeater the 53.03 mhz transmitter with the Hal9000 AI controller is located at Burnside,Ky. I sold the 6m receiver site on Morse Hill 20 miles away was not a clear signal path.The UHF link has a no tone receiver in drift scan mode that is listening for alien signals from the cosmos. This about graviational amplify "FM Radio Waves" signals. I am getting them,but I don't know what they are or where they are coming from and how they are being produced. Aliens~! The truth is they are signals that can't be identify. 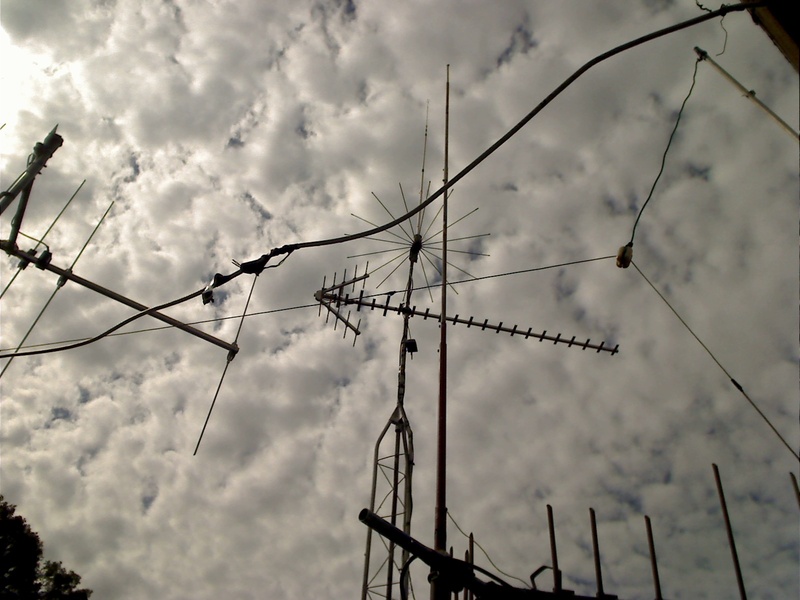 A Link to KY6MTR 2 meter repeater split site webpage. 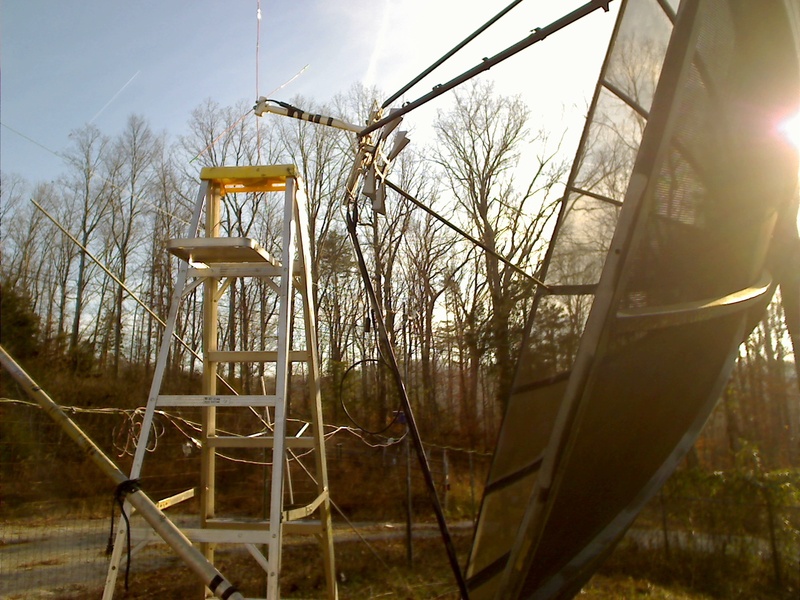 antenna works great on 6 meters FM as a 1/4 wave. with a case 54" trailing ground plane wire. 6 dB gain or two full S-Units. As such at 2.4 ghz, I am legally allowed to use Maximum Transmitter Power Output (TPO) of 100 watt or 50dBm. in channels 1 through 6 (inclusive) as long as i don't interfer with anyone. Since my access point is a WRT54G Linksys WiFi (22mw) RF power and receive system. I will not be running under amateur radio license, if i was then the site must comply with amateur radio rules, you can not use WEP encryption, must enable SSID, communicate with at least one other licensed ham, and broadcast your callsign. This site is operating under the Wifi ISM rules that are allowed to use encryption, but are also restricted to no more than 36dBm (4 watts ERP). to seek professional advice beforehand.